Jules: Can you talk about your choice to use oils for Bad Apple? Edward: My desire to work in oils has always been a selfish one, and I’m terribly selfish. I love the medium, the texture, the smells, and ultimately the surface of the finished product. My first two books were painted in acrylics, and I found myself missing the oil-painting process, which I have been doing sporadically since my teens. 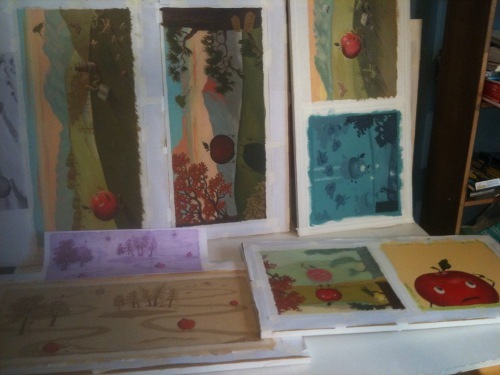 Bad Apple seemed like the perfect book with which to reopen my box of oils, as its compositions are filled with lush outdoor scenes of trees and water and hills and red, red apples. 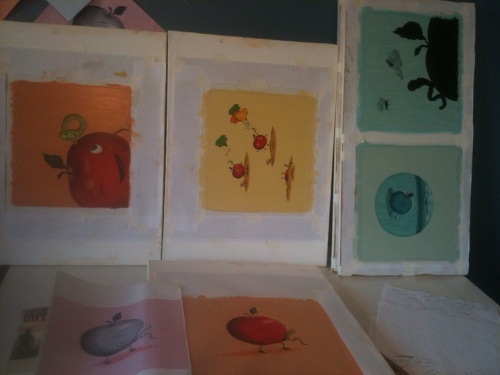 “Bad Apple paintings in the studio before I finished them and handed them in. 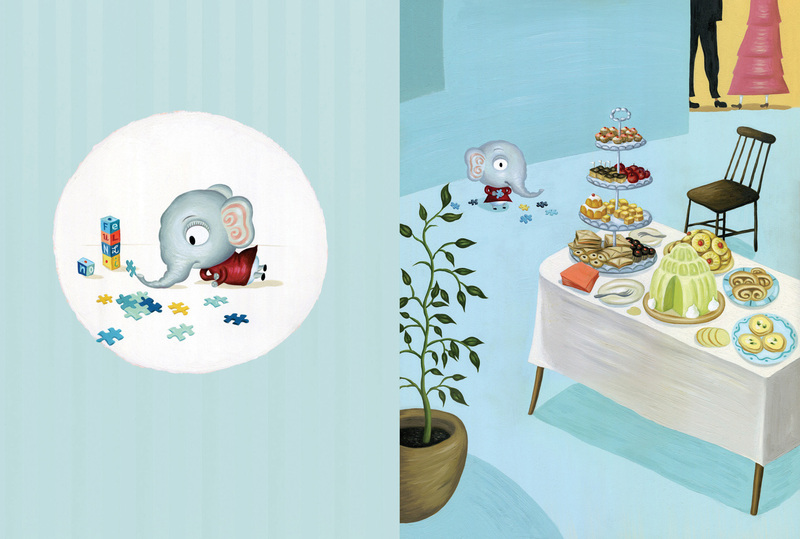 I continued the oil painting trend with Tiny Pie and had fun tackling interiors. 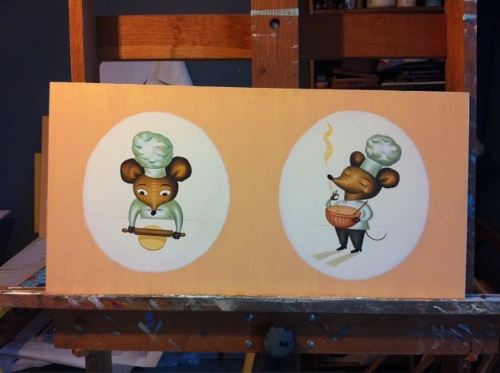 For that book, the publisher only wanted digital files, so—instead of painting on canvas (rolling scanners require images with a flexible surface)—I was able to paint on hard wood board and then scan the images myself. 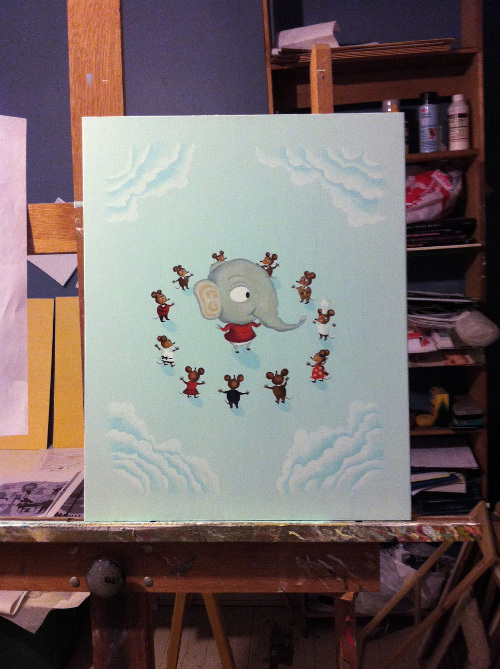 There is something about the flatness of painting on board that I love. And in the end, you are left with this great object. Which, of course, I keep for myself, being terribly selfish. But I haven’t become a complete slave to oils just yet. My friend and former graduate program adviser, Maira Kalman (yes, the divinely talented sometimes walk among us) has done such wonders with gouache, and I think I may try to tackle that medium next. Lately, I have been playing around with exaggerated areas of flatness in my compositions, and it seems to me that gouache could lend itself nicely to this. Jules: Is there something in particular that spawned the story of Bad Apple? “Mac took his new friend to the watering hole to clean off. Edward: I can tell you exactly how the seed (sorry) of the idea for Bad Apple came about. 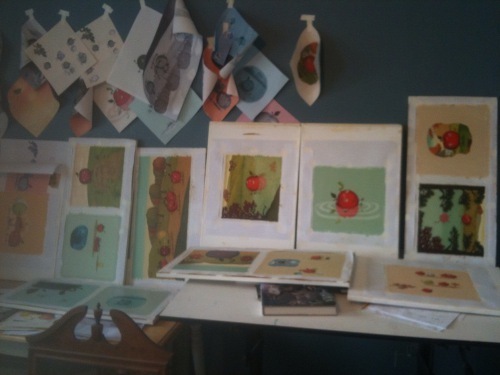 I was on the phone with a pal of mine, who does these nonfiction children’s books about machines and vehicles and the likes, trying to convince him to join myself and my friend Sara Varon for a day at an apple orchard. Sara does books and graphic novels with animals and robots, among other things. My friend wasn’t biting; he told me he had too much work to do, was on deadline, etc. (all things I should have been saying to myself as well, but I’m crackerjack about letting deadlines slide). It had just come to me. And suddenly I couldn’t get the idea out of my head. What was a “bad apple” exactly, and what would a book about one entail? Maybe it would be about an apple and a worm, and they would be friends. Voilà. My busy friend didn’t join us at the orchard that day, but Sara and I had a great time and got to feed some very charming goats. 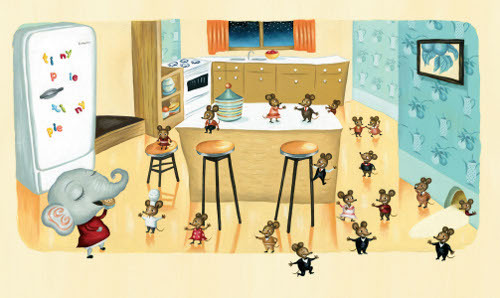 They left her happy but uninspired, and she ended up doing a couple of awesome books about ducks and cupcakes instead. I wrote Bad Apple and it’s sequel, Bad Apple’s Perfect Day. My hard-working friend stayed in, met his deadline, and won the first of several national awards. Is there a moral to this story? If there is, it’s lost on me. Jules: The Publishers Weekly reviewer wrote that your spreads “recall old campground postcards of the 1950s.” Do you/did you set out to be retro, or did it just end up that way? Edward: I like to think of my work as being a bit retro — but with a modern sensibility. One of my favorite teachers once told me that our limitations create our style, and I believe this. I am always trying to be a better painter, but I have also learned to embrace and exaggerate my flaws, which ultimately make my work unique, make it mine. My warped sense of perspective, my crude brush strokes, my flat compositions, my love of aping cartoons of the 1940s and 50s. I used to find a lot of inspiration in other artists with romantic and often retro styles, but I’m trying to let go of that a little. 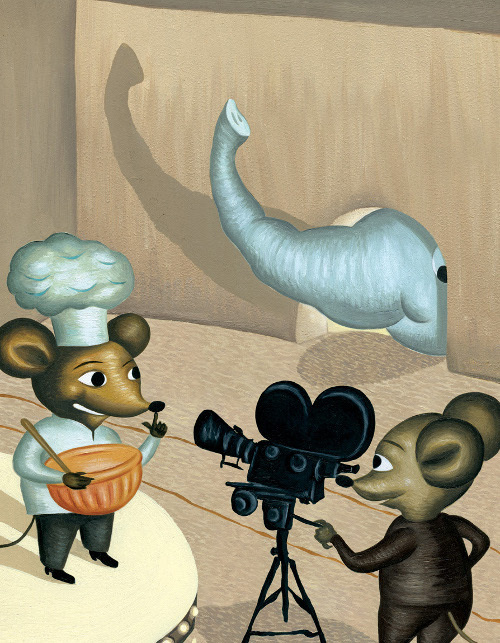 No one will ever make a better William Joyce book than William Joyce, so why try? The best you can hope for is to make your best work in your own voice. Maybe one day I’ll make a better Edward Hemingway book than Edward Hemingway (who, I heard, really isn’t all that selfish). It’s a goal. Jules: You will be teaching at the School of Visual Arts next year, yes? Will this be your first time teaching? Edward: I will be teaching Creative Writing in an amazing new graduate program at SVA next year, called MFA Visual Narrative. I have substitute-taught Creative Writing at the graduate level on and off for several years, but I am really looking forward to working with artists and helping them tell their stories on a larger scale. 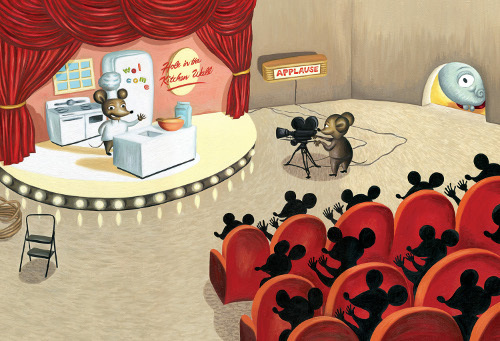 Plus, I like an audience I can tell what to do. Jules: I gotta ask: How does your grandfather’s work inform your writing, if at all? Edward: I’m very proud of my heritage and the success of—and beauty present in—my grandfather’s writing, but he’s had no true influence on my work as an artist or writer. My physique, however, is another matter. Thanks for the gut, Grandpa! 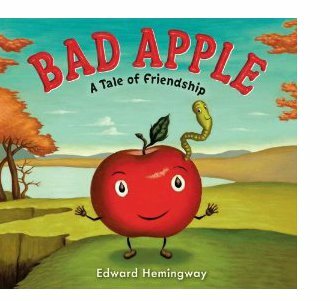 Edward: I am currently working on the second book about Mac the apple and Will the worm, entitled, Bad Apple’s Perfect Day. It’s all about making the most of a disappointing situation, something I think we all have had experience trying to do. 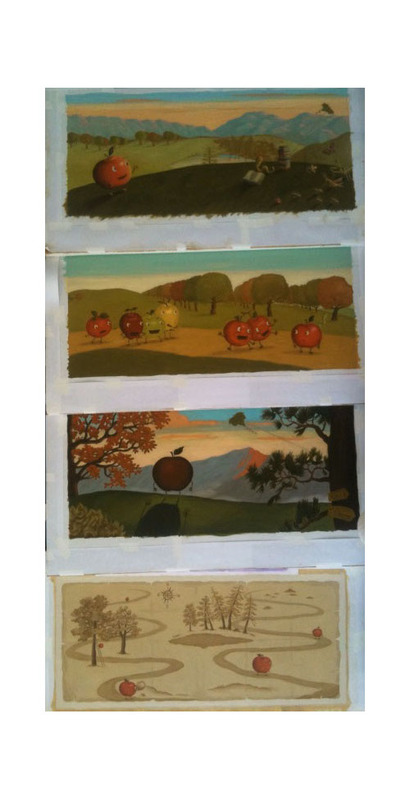 I’m also in the beginning stages of another picture book and trying to get Bad Apple adapted to the small screen. Jules: I’m posting this on your birthday. Big plans? Edward: It’s my birthday today! I probably won’t do anything too exciting, but I will buy all the local newspapers (remember those?) and read my horoscopes. It’s the one day a year I like to do this, mainly because I hate reading horoscopes, seeing the line, “If your birthday is today…” and being jealous and wishing it was my birthday and it’s not. Ah, the little things. I will also be reading Bad Apple and answering questions about it at Books of Wonder in Manhattan. It’s the first promotion for Bad Apple that I will be doing and kicks off the informal cross-country book tour I’m making in October. BAD APPLE. 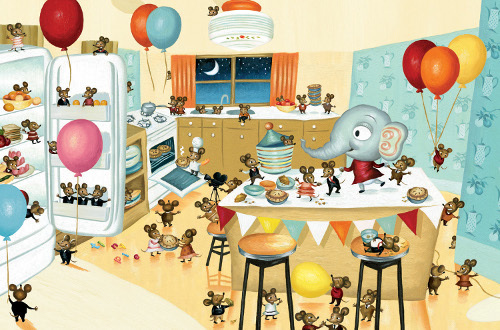 Copyright © 2012 by Edward Hemingway. Published by G. P. Putnam’s Sons, New York. All images here reproduced by permission of Edward Hemingway. I guess most of these are music kicks, but when I’ve had too much writing at my computer, which is how most of my days go, I gotta get up and hear music and/or dance around to it. For writing breaks. It’s just necessary. 1) When I found out Fionn Regan had a new CD, I ordered it to show up on my doorstep next-day. (I think I was slow in finding this out, so by “new,” I mean 2012 — and I think it even saw a 2011 release in Ireland, where he lives. Generally, I’m confused—and I usually am—but it’s new to me.) It’s good stuff. Wanna hear a tune? This band, The Kingston Springs, is all new to me, but all I know is that I liked that when I heard it this week. And I turned it up very loudly. 4) And then one morning this week—because Rufus Wainwright’s voice makes my day better and because I think this song is flawless, what with THAT piano and THAT bass and, again, THAT VOICE!—I listened to this. And it started my day off right, even if it’s not exactly a happy song. I just had to sit with my eyes closed and soak it in before I could work. Surely, that’s more information than you need to know, but all that’s to say: It’s sublime. On account of that piano, I could listen to that song about seven hundred and seventy-seven times in a row. 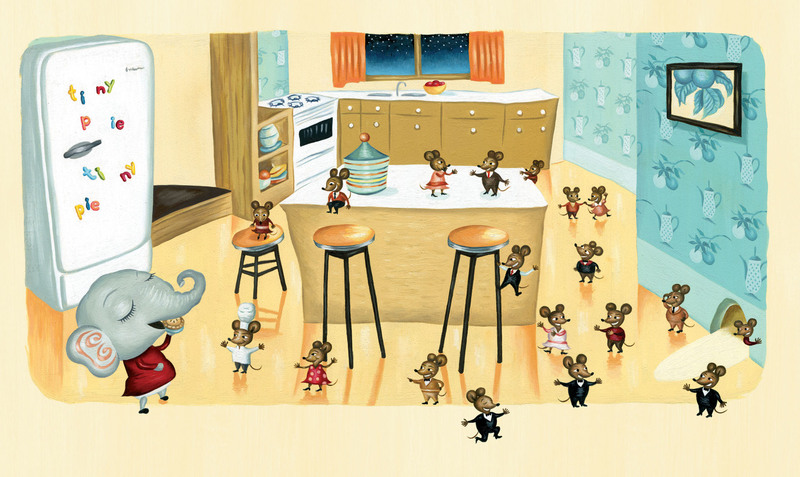 5) You all remember how on a monthly basis The Bluegrass Special would include 7-Imp content? Well, now it has a new name: Deep Roots. It has a new focus (“roots music & meaningful matters”) and a new look. I am still flattered that they include 7-Imp content every month—their new issue includes my interview with illustrator Christian Robinson—because the guys who do this publication are very talented. (Here’s an example of the goodness you’ll see there re music). 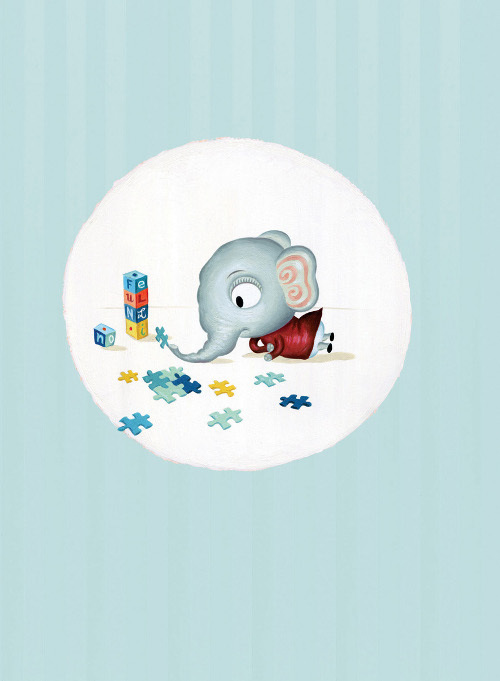 Many thanks to David McGee for including 7-Imp in this wonderful publication. 6) I love seeing the people my daughters are becoming. That bad apple looks good! I’m putting it on my (special) list. I am glad Mr. Hemingway and Miss Vernon (ah, how I love HER tale of friendship as well) went to the Orchard despite deadlines. Thanks for that lovely post, for the music and I am crossng my fingers for you at your talk…you’ll knock their socks off! I love his quote—The best you can hope for is to make your best work in your own voice. 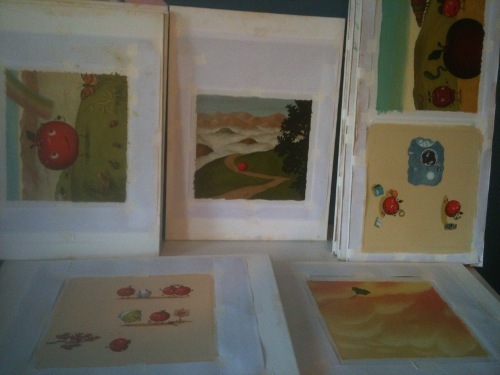 I really enjoyed seeing all his art and how the idea came to him for Bad Apple. 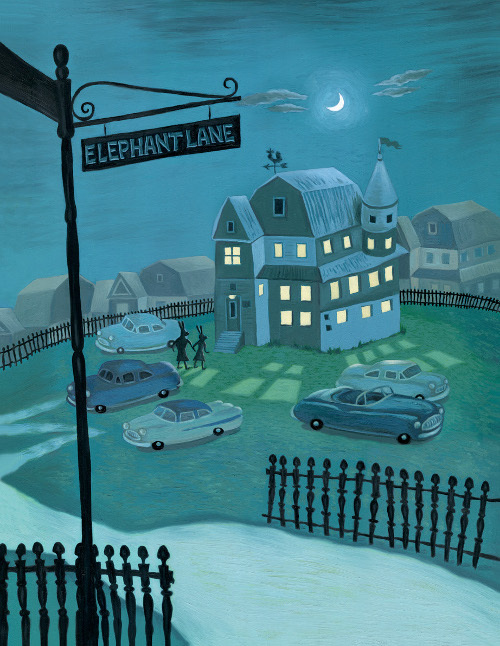 My favorite visual–Elephant Lane outside at night. I know you are doing well with your presentation. I am so wishing I could be there. I really like Dogwood Blossom. 4. 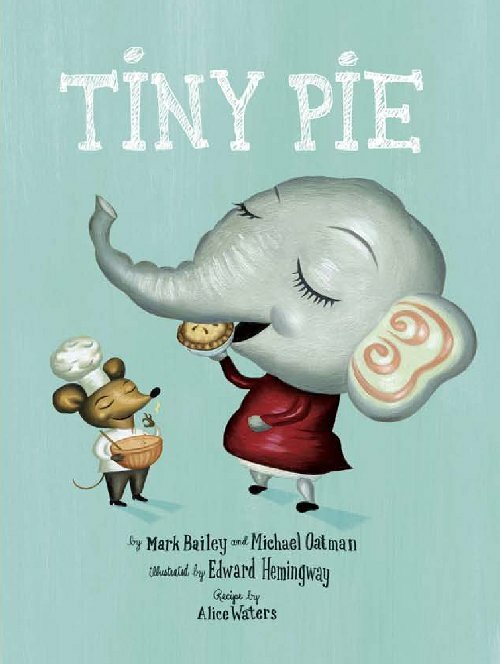 Reading wonderful picture books and two wonderful MG books this week. Hi there, Edward! Thank you for sharing your art with us. Best of luck with your creations and your classes. Happy birthday! 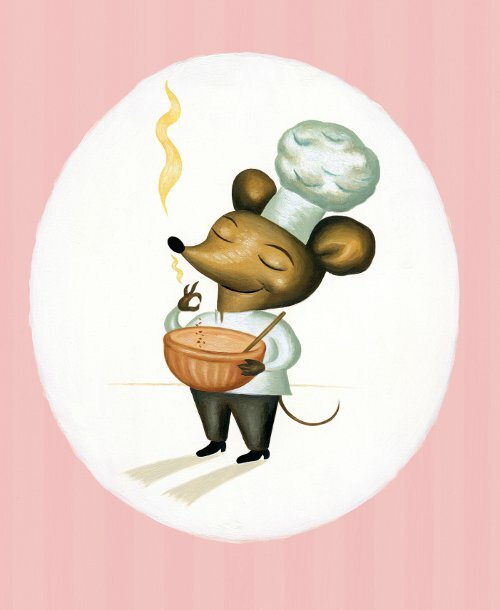 Jules: I have now come to expect cute little mice at 7-Imp. 😉 Have a wonderful time at the conference today. Yay for your awesome daughters. JES: I obtained The Night Circus from the library and will read it later this month, if not this week. I’ll let you know what I think. Thank you for the recommendations! Margie: Shorelines can be so, so pretty. Hi to Theo. 1) One of my screenplays made it into the next round of a contest for filmmakers, which means it’s getting a reading this Wednesday. I’m extremely excited. The finalists are determined by the votes of the audience, so I hope they like what they hear! After a few more rounds, the top 3 scripts get funding to produce their short films. 7) Leverage continues to inspire me as a writer and as an actor. Looking forward to the summer season finale tonight! Thanks so much for another great post! I hope you’re having a wonderful time at the conference and am sure you’re doing AWESOME! I’ve already posted about Catcher in the Rye and a few posts on fairy tales! 4. Taught my first art history class of the year, and I think it went well, I got the kids talking, almost all of them said something from the 5 year old to the 15 year old, it was great! 5. Was walking to class Tuesday morning and was surprised when I realized I wasn’t dying of heat or sweating, but there was actually a cool breeze instead of a humid wave of thick air! 6. Emailed my 8 fairy tale questions to Cornelia Funke! I am so excited, she is literally pretty much my favorite author since ages ago and she responded to me on facebook and told me she would love to talk to me about fairy tales!! Oh, Edward’s work is lovely! I feel inspired now, just to be me (and possibly a better me than I used to be)! I also am excited to read The Night Circus (it is staring at me from my bookshelf). Getting a kick out of my kids reading and doing their homework (voluntarily) right now, beautiful weather, getting ready to send out a new postcard this week! 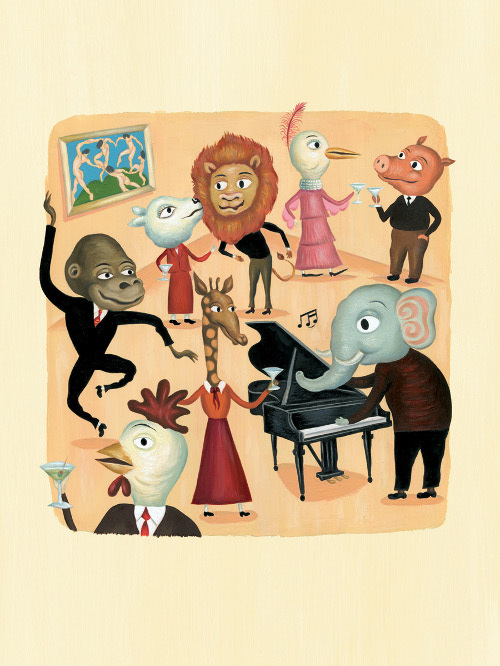 All best to Jules and friends of 7-imp! Happy Birthday, Edward. 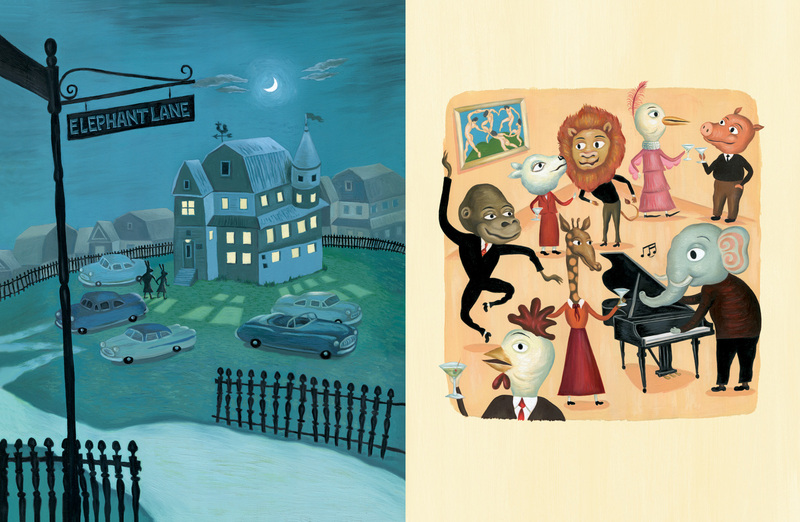 Love these spreads, especially Bad Apple looking into the sunset. 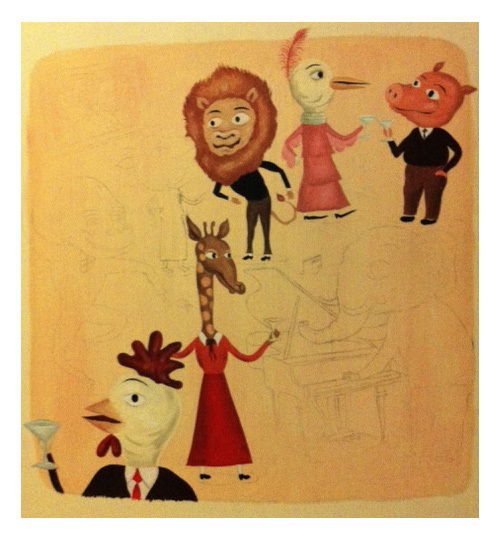 5. this blog has been the inspiration for my own illustrator series this year. 6. Finally thought of a present for my best friend’s wedding next weekend. I’m super-busy this afternoon but couldn’t resist stopping by for a brief visit. Love seeing everyone’s kicks, as always, but I’m afraid I’ll just have to leave this cardboard box of my weekly 7 kicks on the 7-Imp floor for y’all to rummage through at your leisure. They’re all very nice ones and I know each of you will fine something you like: there’s a movie rec, and a music video, and, well, you know how the world is sometimes too much with us? Yeah. THAT. I’d love to see Sara’s cupcake and Edward’s apple meet one day. Thanks for sharing. Jules-Music and dancing is very important. I’m sure you are rocking it at the conference. I love all of your kicks Margie. Sounds like a wonderful week. L.W.-Congrats on your screenplay, Yay! Nina- Hooray for new postcards. Can’t wait to see it. Joanna-I’m glad you got to go home. Sounds like a long time coming. 3. Arty girl who doesn’t like sports has joined the cross country track team?! 4. Tweak, tweak, tweaking my website. 5. Hero husband fixed the dryer. Here is a post I wrote a while back about my neighbor. We’ll miss him. I love Edward’s stuff. I hold him up there with Sergio Ruzzier in being one of those incredibly distinct and stylish, somewhat surreal/weird (in the best way! 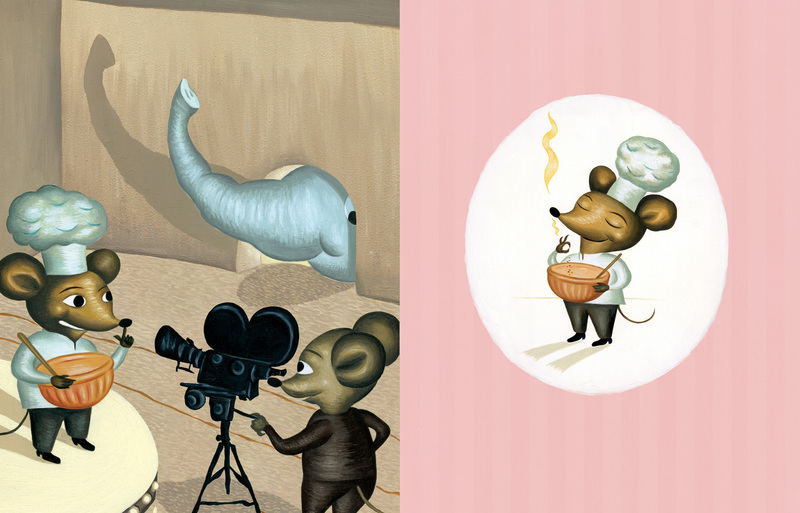 ), dreamy pic book makers working today. Great post and behind-the-scenes coverage! Love the artwork today! I hope you went well this morning Jules! Jess congrats on the art class, I hope I remember to read your blog about it when I am more awake! Moira, trumpet in the mail sounds very sophisticated and cool. 1. First sighting of chipmunks today! They are faster, smaller and even cuter than I expected! Thanks, Lisa — and everyone! The talk went well. Whew. That’s done. Margie, now that was a week full of rich kicks — gardening, bookstores, walking, reading. I love walking and not just ’cause Walker is my maiden name. Little Willow! Kick #1 is so terrifically exciting! CONGRATS! Fingers crossed for you! I can’t stop using exclamation marks! Keep us updated. Please. Hi again, Jess! So glad you’re enjoying classes. I hope to read about them at the link you shared, once I get caught up on stuff. Also, I think my daughter will like the Inkheart series. I keep telling her about it. Hi, Nina! Thanks, and all the best to you, too! Joanna: Shucks. 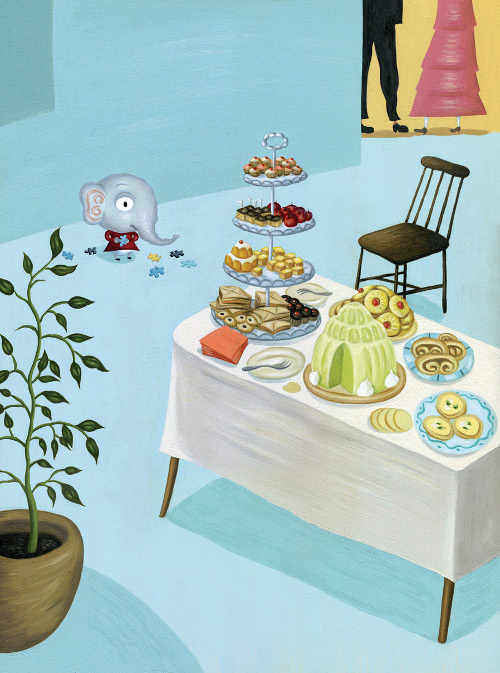 I’m happy to read 7-Imp was a good kind of inspiration. Do you know I’ve never read Chains? Gotta fix that. John, I’m good with cardboard-box kicks. (I like that idea.) Have a good week! Moira: Thanks for the music. I had no idea Willie Nelson had musician sons. Sorry about your loss. “Picture This” sounds like it was fun, though, and a highlight of your week. And cross country track? Really? YOU GO. Emmaco: You’re here! I had fun just reading your kicks. S’mores! Wow. I wish I lived near D.C. and could meet up with you. And you don’t celebrate Halloween in Australia? This is the Thing I’ve Learned From You This Week. Moira: Gotcha. I wholeheartedly approve of the sitting-around-and-eating-cookies. Nina: You have a cool name. Anyone know which book made me like that name? Joanna: I hope it was a happy homecoming. Thanks, Moira. Sorry for your loss. Music is wonderfully therapeutic. Emmaco: Please say hello to the chipmunks for me! Have un in the States! Thanks, Jules! I’m all kinds of flattered. And motivated. Little Willow: Yes, the conference was fun. Which book made you like the name Nina? I’m stumped. Oh, I hear ya on Rufus Wainwright. Have you heard him sing What Are You Doing New Years Eve? It’s my favourite holiday song – I could listen to it in July. I don’t have a weekly list but I did a Seven Summer Kicks on my blog! (I think it pinged you.) Cheers! By the way, have you seen this? Graphic novel edition of A Wrinkle in Time! With preview! Hi, Christian. Those were fun to read. Raspberries are the best, and “writing is revising” speaks to me right now. I’ve read about that graphic novel but haven’t seen it yet. p.s. Christian: No, haven’t heard Rufus sing that yet. I MUST! I was about to write this comment, when I saw Matt’s note above. Over-kind of him, especially knowing his exceptional standards. What I wanted to say, is that Ed’s work is going to become indelible, thankfully. I can’t say the same about most people publishing today.